Available in five styles, including our popular unisex Kimono and Shawl Collar robes. 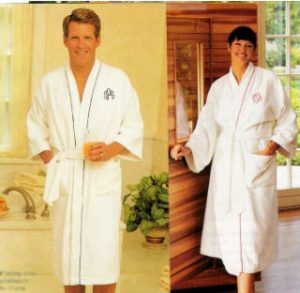 All of our robes are made from 12 oz (400 gram) 100% plush cotton terry velour, featuring thirsty loop terry on the inside and heavenly sheared terry on the outside. Envelop yourself in one of our Kimono style robes, perfect for men and women, and include three initials or name, in thread color to match your robe’s piping. Our shawl collar robe provides warmth and comfort around the neck making the perfect robe to slip into after a relaxing bath or invigorating shower. Our women’s hooded cover up is a classic favorite, featuring a zippered front and long sleeves for year-round wear. Embroider your loved one’s names or initials on this robe to make it a wonderful gift for any occasion. Our scalloped women’s robes include beautifully designed edging for a touch of elegance. Try our ballerina and knee-length types for optimal comfort. Each of our women’s and men’s bathrobes is made from a plush terry fabric for comfortable wear every day and is available in 17 colors!